The P-2000 micropipette puller represents a significant advance in the technology of fabrication of micropipettes, optical fiber probes, and nanospray tips. The P2000 integrates a CO2 laser-based heat source with the technology derived from our extensive experience with conventional pullers. This system offers capabilities unmatched by other pullers. While the P-2000 puller is suitable for working with most conventional glasses, its primary advantage is the ability to work with quartz glass (fused silica). Quartz offers superior material properties for a variety of research applications. Quartz is stronger than other glasses and can facilitate penetration through tough tissues which would normally break conventional pipettes. For applications requiring a low noise glass, users will find that quartz is the lowest noise glass available. Quartz contains none of the metals used in conventional glasses. Optically, quartz is virtually free from fluorescence when illuminated. 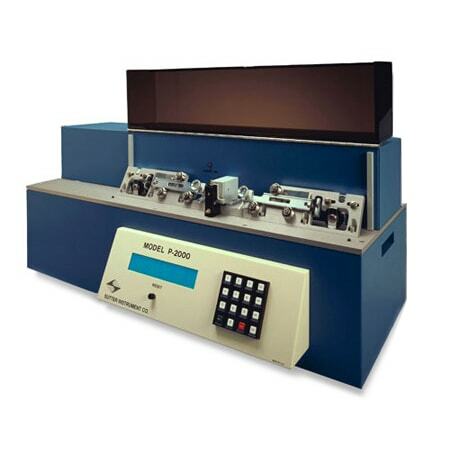 The P-2000 pipette puller can store up to 100 separate programs, with each program consisting of up to 8 command lines. Programmable parameters include; laser power level, scan width, trip velocity, delay/ laser on time, and hard pull strength. As with larger diameter glass, a wide range of tip sizes and taper geometries can be produced with the P-2000/F and small diameter glass. We have drawn optical fiber tips ranging from less than 10µm to more than 5µm. Please consult our technical staff for further information. Fully programmable — including heating filament characteristics. Optimized velocity sensing circuit for maximized sensitivity and reproducibility. Preprogrammed sample programs for intra-cellular and patch pipettes. Special programming available upon request.